A year with more footy played in Germany than ever before, one that saw the Düsseldorf Lions enter the competition as club number five and a season culminating in a finals carnival in Berlin, 2004 was a year of consolidation for the AFL Germany. 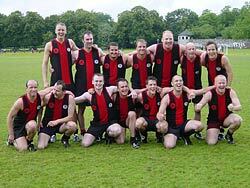 For the better part of a decade, the Frankfurt Redbacks and Munich Roos remained the only Aussie Rules clubs in Germany, a land whose sporting prowess is associated with successful soccer sides, champion tennis players and formula 1 drivers, olympic handball medals and a few pro-gridiron franchises. Now they've been joined by the Berlin Crocodiles, Hamburg Dockers and the Lions - with interested groups aiming to found clubs in cities such as Hannover, Cologne and Stuttgart. Newcomers Düsseldorf impressed, their only home and away loss to the Roos in Munich, who entered the finals undefeated. However, it was the Frankfurt Redbacks, lead by German footy pioneer Malte Schudlich, who surprised the pundits by defeating the Lions in the preliminary final, then the highly-fancied Roos in the Grand Final. In the wooden-spoon playoff, Berlin defeated Hamburg, a team founded by German high school students returning from exchange visits to Australia in 2003. The future looks bright for football in Germany, with the foundations for a national team - 'Die Deutschen Adler' (German Eagles) - laid in a pre-season match between the AFLG's expat Australian and home-grown German talent. The Frankfurt Redbacks after their Grand Final win. Picture courtesy of the AFLG.